Awakened by the metranome sound of our room’s ceiling fan , the early morning Accra traffic outside, and a light knocking on our door. I climbed out of bed to begin my third day in the same clothes and to greet the helper boy saying, “Your friends are calling, it is time for breakfast.” We had slept in just a bit. Roommate Kyle and I entered the bright morning courtyard to see our entire group already there and enjoying a meal of eggs, peppers, tomatoes, and chicken sausage. We barely finished eating before the bus arrived to take us to lecture. 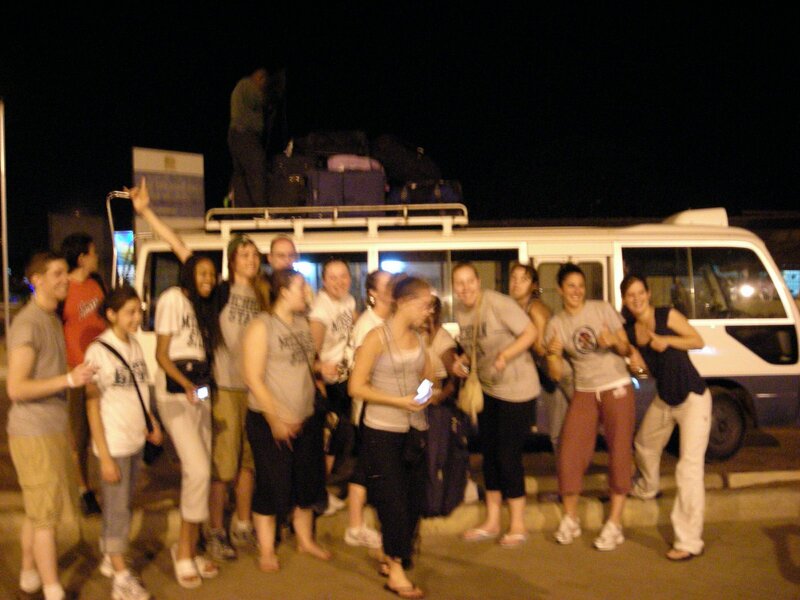 Our first site of the campus was the welcome arches and sign for the University of Ghana. We drove directly to our seminar room in the School of Communication. Professor Tims gave us our welcome and first introduction to the University and then we left for lunch. We had lunch in Osu, where there are many good resturants and tourists. 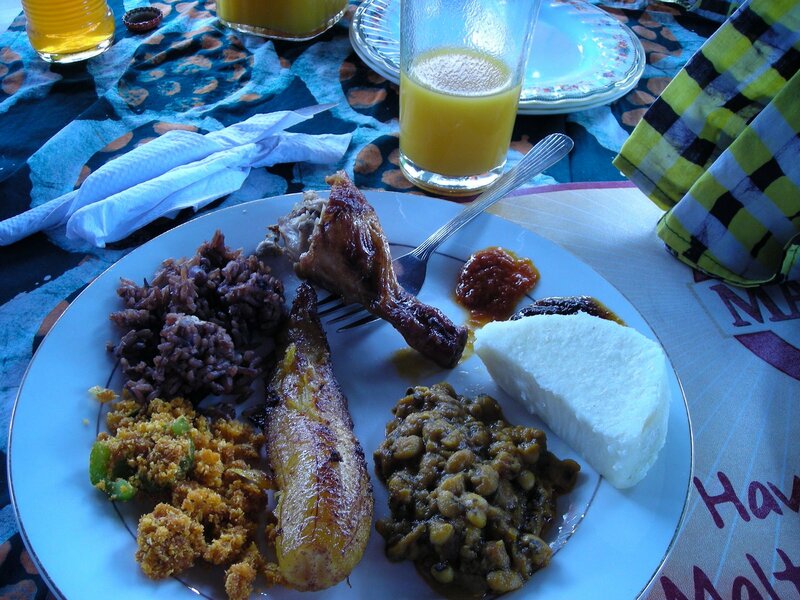 At the Country Market we were treated to a variety of delicious Ghanaian dishes: fried plantain (banana), beans & rice, gari foto (from cassava), fish, chicken, yams, spinach, and freshly squeezed mango juice – liquid heaven. 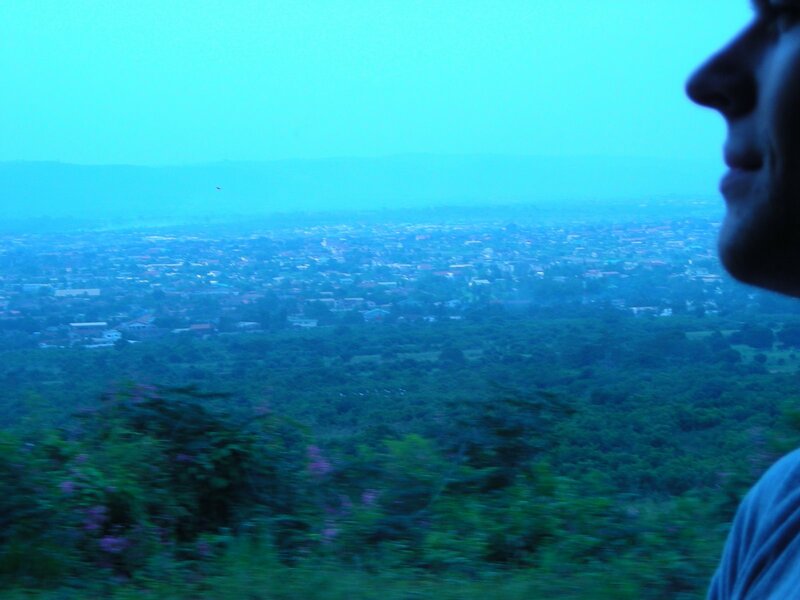 From our travels to the University and to lunch we were able to get our first views of the city of Accra. There is a lot of construction happening everywhere: hotels, apartments, shops, huge structures, a stadium, and more of which I have no idea what they will turn out to be. The economy must be doing very well in Ghana (global economy) from the boom in cocoa prices and the gold supply. As I have stated before it is much like Kampala, but there are is more developed buildings, road infrastructure, traffic lights, and no men with AK-47s at the store fronts. There are many skyscrapers and massive buildings built from foreign companies investing in the country. The traffic flows well, most of the time, because sometimes the stret lights do not work and it breaks down to the wanton driving that Accra’s taxis are known for. All over the place there are hawkers with anything and everything that you could want or need. From bags of water, plantain chips, fan-choco, toilet paper, pens, DVDs, posters, etc. – the list is really quite endless. These hawkers have made navigating the streets difficult and many accidents have occurred, but these hawkers also provide a walking grocery store for all the people on the move during the day. The majority of hawkers sell water during the day in bags, yes bags and it is safe. At night most hawkers are selling apples in bags of three or toilet paper rolls. Our first lecture was from an ‘insider’ on Accra and Ghana. It was a bit boring and nothing that our amazing bus driver, Eric, had not already told us. After the first lecture we had a bus tour of campus. 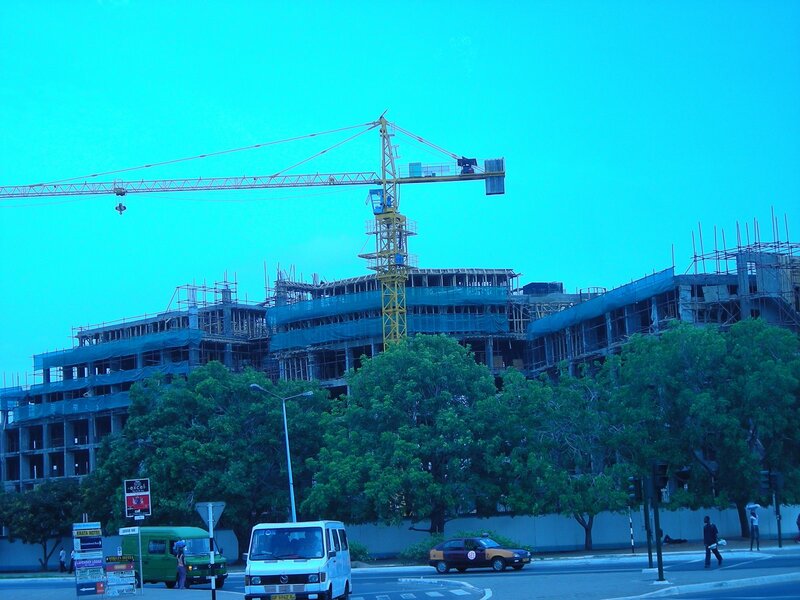 The University of Ghana, or Legon University as it is known to most Ghanaians is the best in the country. It is a very expansive campus and reminds me of MSU, but MSU is much more flat. Some of the buildings look nicer than those at MSU. There is now a threat of an exam boycott because the University is asking students to leave the University housing on campus to the more expensive hostels in Accra. On our tour we traveled all the way up the hill to the Vice-Chancellor’s house where we were met by an amazing view of Greater Accra below. After the lecture and tour we went to the ‘art and culture market,’ or in better terms the Ghanaian way of saying tourist trap. It was an intense experience. As soon as the vendors saw a bus full of Obroonis they flocked and told of the wonders of their wares. It is customary for Ghanaians to ‘make a friend’ and so I had about 3 by the end of the experience. Every stall that you go past someone sticks out their hand to greet you, but you are not given your hand back and in return you receive an earful about a nice shirt, or cloth, or jewelry. After a while I met a very well spoken man who asked if I was looking for drums. Heck yes I was! So I followed him to his shop. He and his friends proceeded to bring over drum after drum and we worked on a price. Now in Ghana you have to bargain for everything. They give you the Obrooni price and we are told to cut that in sixths and offer that as a starting price. I bargained, probably not too well and not as far as I should have but we agreed on a price of 550,000 cedis, which is about $60 USD. 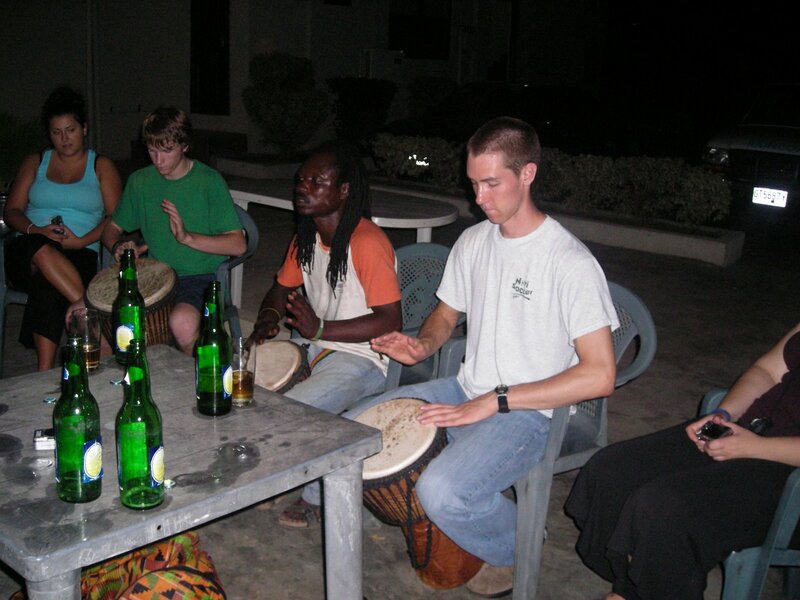 I would say that is not bad for a handcrafted, quality drum from Ghana, when in other places you would be charged upwards of $300. Before we settled on the price I told him that before I bought the drum he had to teach me something, so we played a bit before finalizing the price. I was still a bit wary and told him that I did not have the full amount with me. No problem they would bring it to the hostel tonight and my new friend, Omar, would bring his group and we would play. After dealing with all the ‘friends’ and sellors, I had to get away and join my friends who had already escaped and were watching a large football (soccer) game right next to the market. It was a great game, but the more interesting one was played by a group of players not in the larger game. 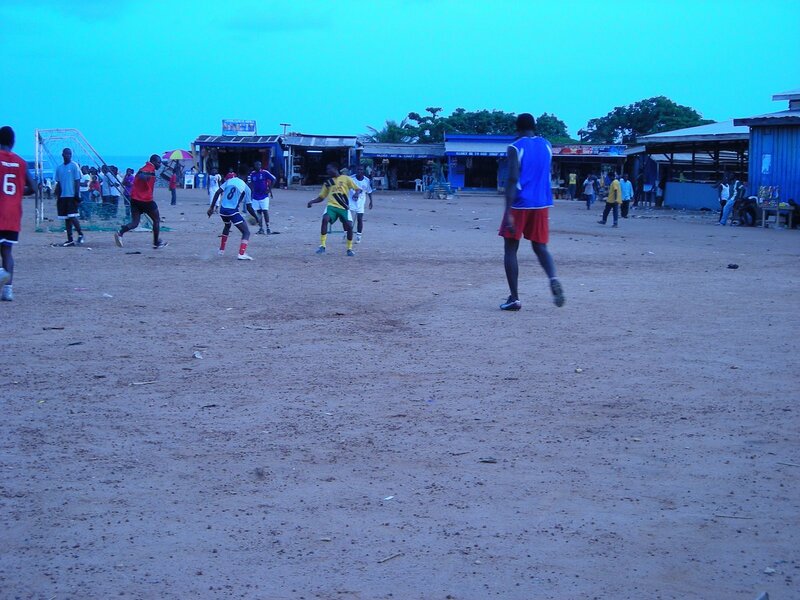 They had tiny nets with nho goalie and used the area next to the market as well as the people in the market and the big football field as a game field. The were very skilled and cursed anyone who got in the way of the game, as it was a game that took away a major walking path. Later that night as we sat chatting in the hallway, one of the students came up and said that there were visitors for me. Omar brought the drum and his drum teacher. We sat and drummed and hung out for a while. I learned a lot and it was great to be learning of the traditional music. Omar’s drum master was a great teacher. He has dreadlocks, and the local people call them the rasta. They see the rasta as people who they can learn something from, however others see the rasta as bad people looking to make trouble. At any rate they were nice and I learned a great deal. Here are some great quotes from the drum master about life and living, “It is nice to be nice, we have the same color eyes and we bleed the same color blood” and “Africa is about much experience.” When he said the last line we were talking about travel and education. He said that it is great to be taking something back, experience, but also culture and music. It will be as if I did not just travel to Africa, but I will be able to give my friends a good idea of what it is like and I can, in turn, teach them. I would say he had a sharp mind and they told me that they could come by every night to teach me more. The bus showed up and I was finally able to get away from the rasta lectures on life and we ventured back to the airport to get our ‘lost’ luggage. It was a fun trip. 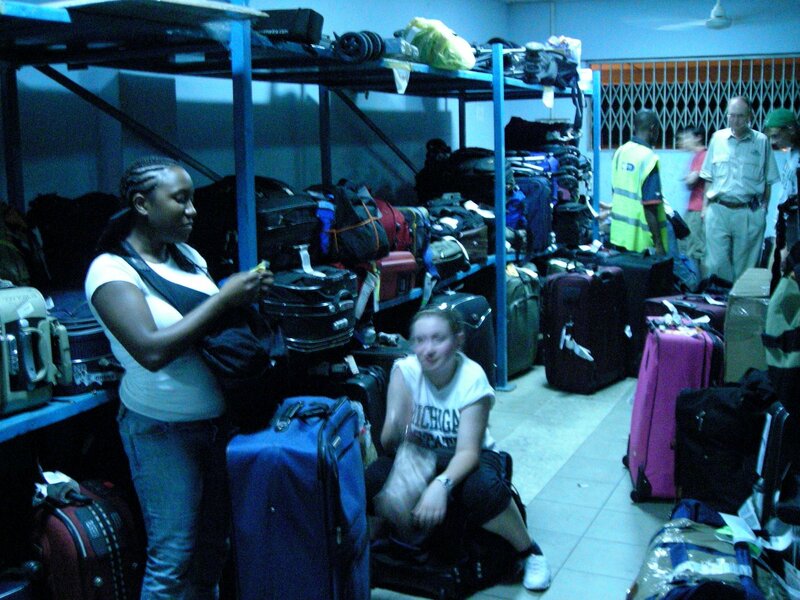 There was a long line, because many people did not get all their luggage on the same night as us, and they beat us there. The next day began again with waking up late finishing my french toast just as the bus pulled up – no time to shower (day 4 no shower, gross). We went straight to the University and had lecture from Professor Passah, head of the History Department, on the history of Ghana and its people, colonialism and its impact, and its positives and negatives. For an African Studies major these were not very interesting lectures as I had heard them all before, but learning more specifically about Ghana was great. In the 15th Century, the Portuguese discovered the vast gold wealth of the Ga people. They had been searching to find a gold source that was not throught the Middle East, since the Arab states had a sort of monopoly on the gold trade and the Christian Portuguese did not want to trade with the Muslims. The Portuguese also knew that the gold from the Middle East did not originate there, and so there must be a source elsewhere. With their great sailing abilities and inventions such as the compass and magnet, the Portuguese found the Gold Coast. The Portuguese had the goal of spreading their religion as well as gaining wealth, so they built a great education system to teach and convert. This is part of the reason that Ghana has such a high rate of educated citizens. Their discovery of gold sparked a gold rush and the Dutch, British, French, German, and other nations rushed to set up fortresses and trading posts along the Gold Coast. This began the trade in slaves as well. Later in 1807 the British abolished the slave trade in paper, but not in practice. The slave trade was perpetrated worst by the British. The castles of Cape Coast and Elmina (La Mina – The Mine) were finally both controlled by the British and the British were able to claim Ghana as its colony in 1901, when all other imperial powers had left. The Btisih also gained control by working out an agreement with the Ashanti people, who fought hard for access to the coast to trade, for peace. It was signed by the chiefs on 6 March 1844 in Palaver hall at Cape Coast Castle, and is called the Bond of 1844. And so now today the greatest influence is Britian as Ghana is surrounded by all french speaking countries. The slave and other trades have relegated Ghana to being solely dependent on cocoa and gold as its wealth is focused on its resources. No industries for production were created because everything was exported to the imperal powers where industry had developed. We learned about colonialism and its impacts which was nothing new to me. However, the professor claimed that there were positives of colonialism. Sue education was great, but forced and using unity as an argued positive will not work. Everyone here has a sense of being Ghanaian, but the imposed boundaries divided ethnic groups, increased tensions, and took no consideration for nations of people in the area which were already developed. Unity through division is not a positive. After the lectures we were let out for two hours to explore campus on foot. We headed down the main road,mostly lost, and found an internet cafe – I had to write to mom and let her know that I had indeed made it safely. As one could have guessed she had already emailed me with a slew of questions. I emailed back with not enough time to blog and we had to quickly find lunch. 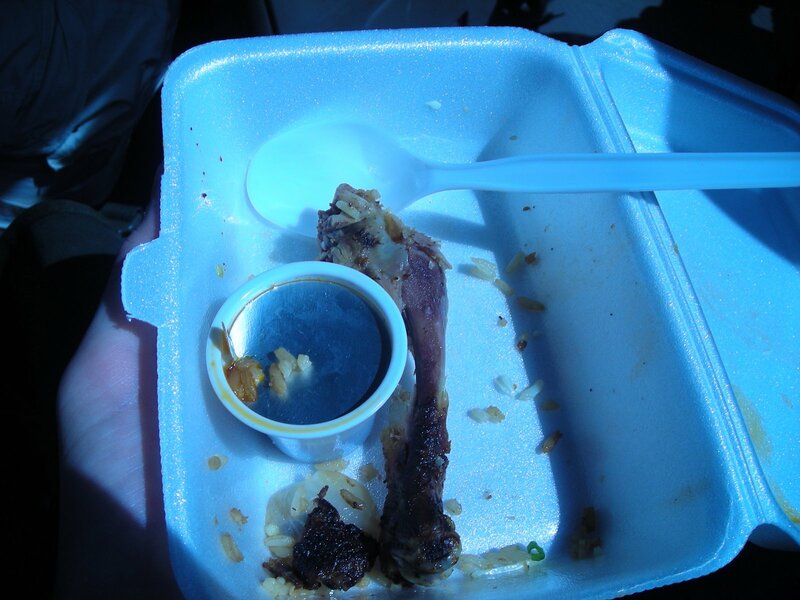 We stopped at a cafeteria and asked for some rice ‘to go.’ Our waiter thought that we wanted to eat outside or have food delivered. He finally understood and we briskly walked to the bus. We got some very cheap and delicious boxes of rice and chicken. We reached the full bus and headed out to the Kwame Nkrumah memorial park. Many students had no idea who Nkrumah was or what he did for Ghana and Africa. So I was able to give a short history lesson to some. 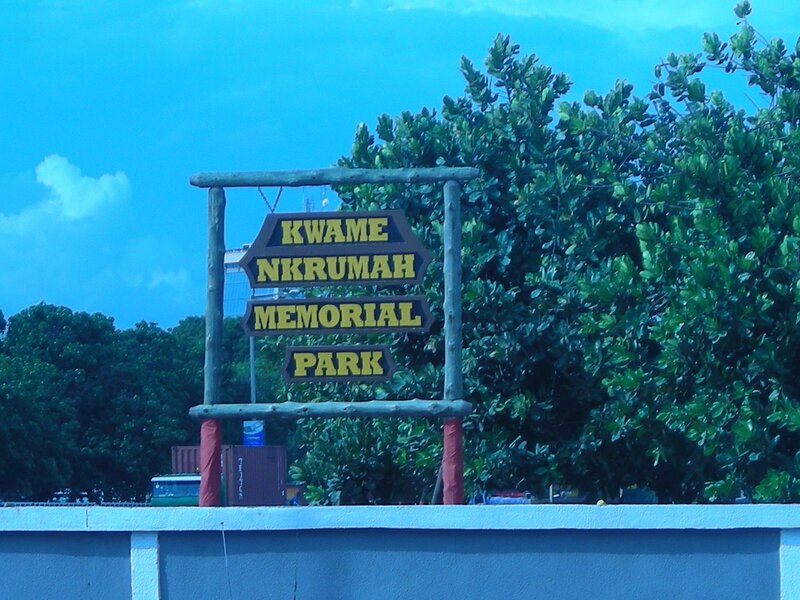 The park was an amazing place, with a great memorial structure representing the life of Nkrumah. There is a large statue of Nkrumah where he stood in 1957 to give his speech, which I had watched in history class at MSU, declaring Ghana’s independence and the moving forward of Africa from colonialism. The structure represented a tree trunk, with aspects of the Taj Mahal, the Eiffel Tower,and other famous monuments. Africa is supposed to have built upon that tree trunk, but it seems we have yet to see this tree blossom. Does Africa still realize this goal of Nkrumah? As you can imagine outside the park hawkers followed us everywhere. We then headed to the W.E.B. 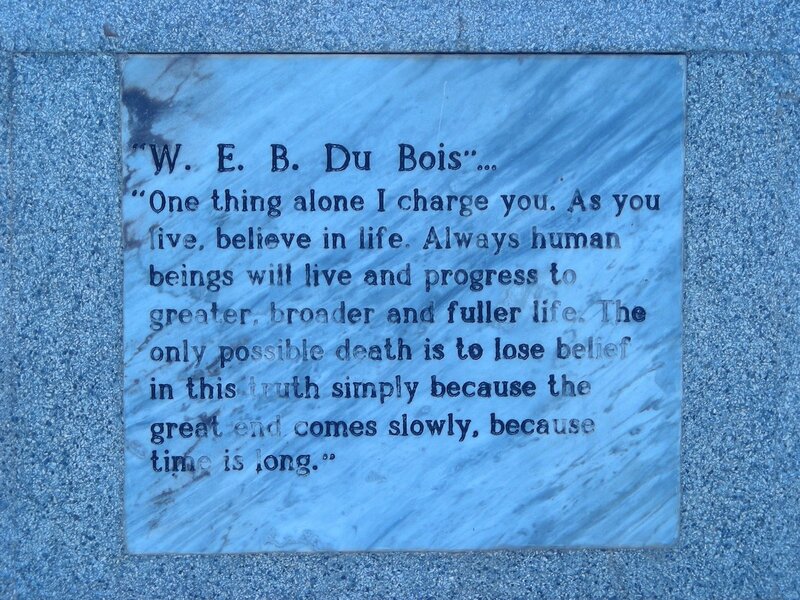 DuBois museum and toured his former house and work. At 93 he immigrated to Ghana to help with Nkrumah’s efforts, he also left the States because of his displeasure with the american people missing his message. We headed back to the hostel after the museums and were on our own again until our 3rd trip to the airport to get the remaining luggage. We took our first solo adventures in Accra. Calling a taxi is very easy being Obrooni and because all you have to do is point your finger down to signal that you want a drop ride. Five of us crammed in a taxi for Osu. I sat in the front. 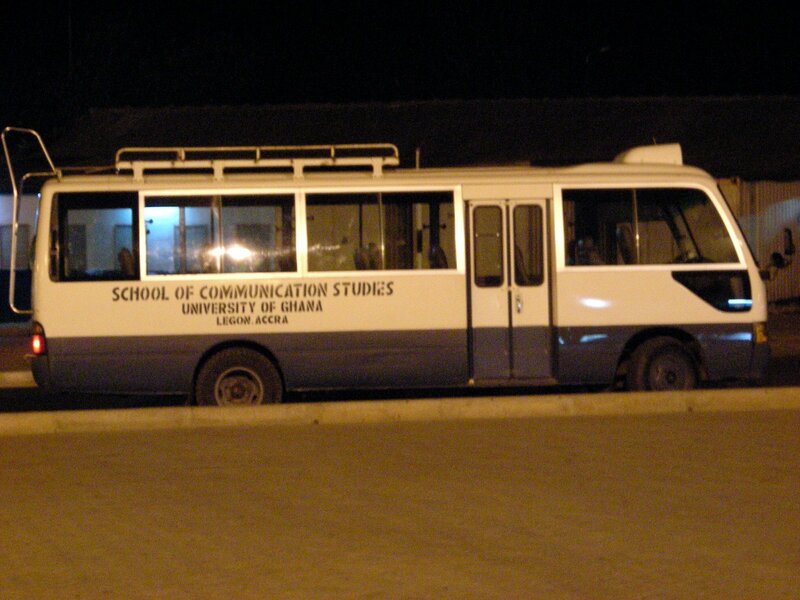 I can tell you from that ride that this was the real Accra experience. Flying down the streets, honking the horn in short bursts, with exhaust and trash fire smoke in your face – This is Accra. 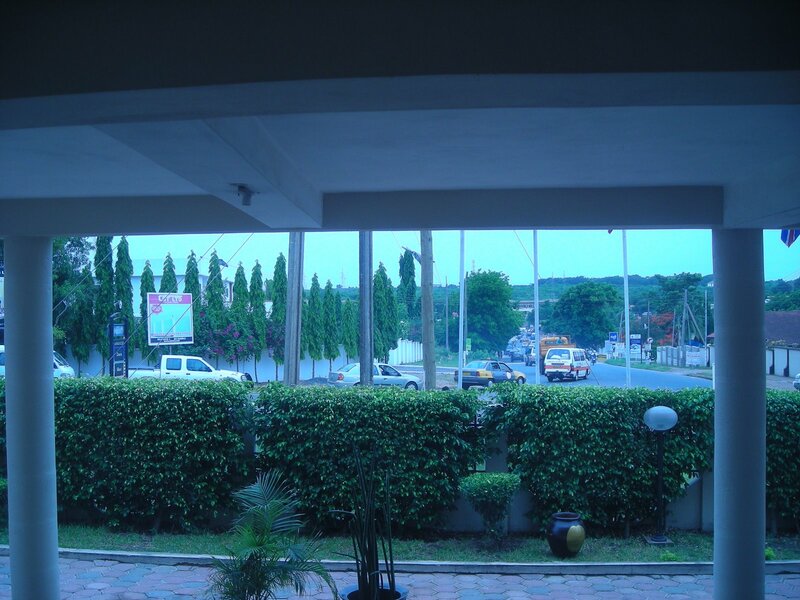 In Osu we ate at Frankie’s which is the hangout for the wealthy Ghanaians and Obroonis. 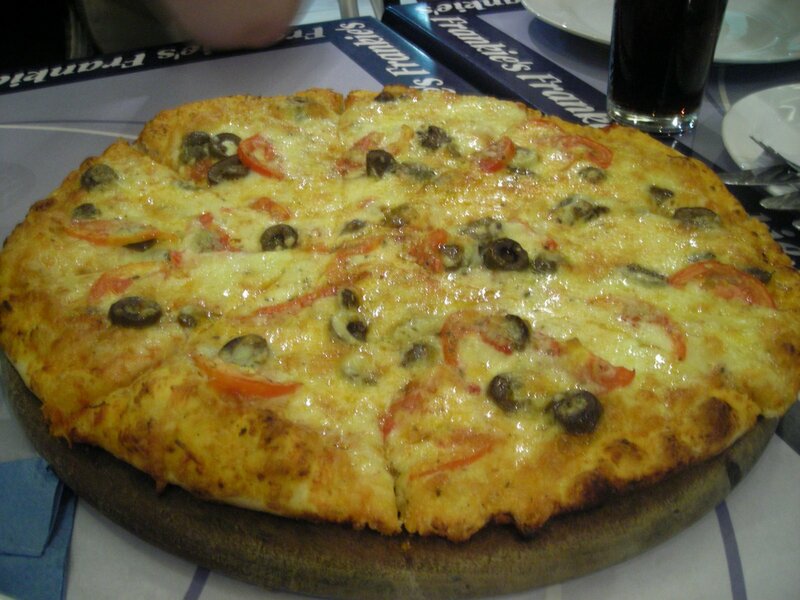 We ordered a delicious pizza. After everyone ate some of us ventured to the streets (dangerous?, maybe) to find an internet cafe and phone cards. Stopping at a gas station to ask we finally located internet. We passed many Obroonis in the street, but none smiled – which is very odd in a city where everyone wants to be your friend. 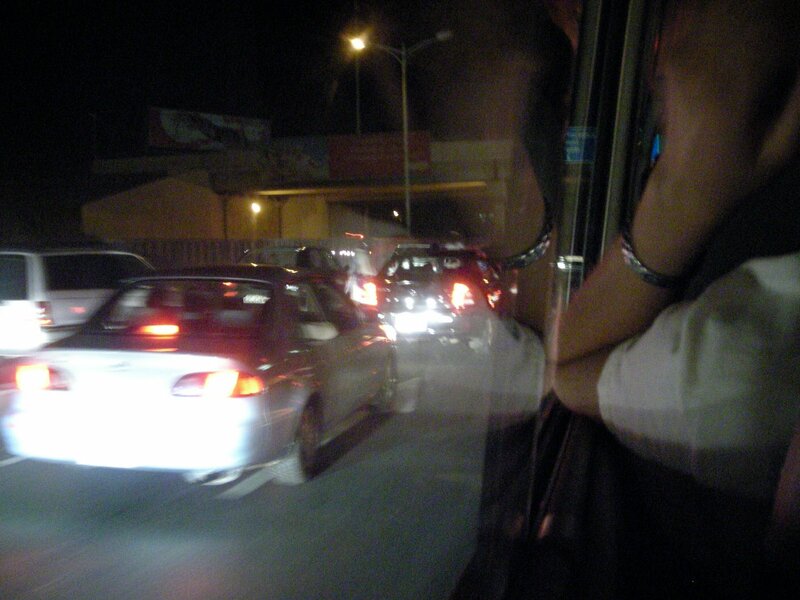 An hour spent online and we easily hailed a taxi to our hostel. We were hanging out and the drummers showed up again. They brought more drums to sell and more people played. It was a lot of fun, but I am still a bit wary of them as they are definitely looking for something. I learned more rhythms and perfected some skills. One of them told me, afterhearing me play, “this is a drummer,it is in your fingers, you can feel it.” What a great compliment. I am so jealous of your amazing stories. It sounds like you are having a wonderful time. I will be expecting a concert when you get back to display your expert drumming abilities so you better practice up :). Hope your days continue to be just as enjoyable. awesome blog! Have a great study abroad this summer. Egypt is definitely different, but still in Africa and its awesome. I can’t wait to come back and explore other parts of Africa… Peace. ALEX! You already have a new drum? At this rate you’ll end up with at least 10 before you leave. The rasta and company sound fun- you’re right to be cautious though. Oh, and keep taking the pictures of your food. They really bring the experience to us.